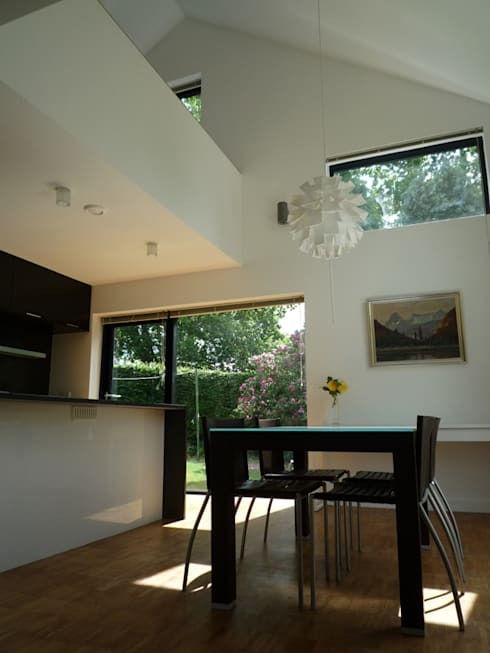 Today, we are going to explore the extension and refurbishment of 1960s House in West Sussex, London. Designed by architect professionals ArchitectureLIVE, this home is proof that with a little bit of innovation and creativity, an old home can be reborn. The home is also a wonderful example of how modern and chic a home can be, despite featuring elements from the original structure. This is English country meets savvy and slick. From the outside, we can see just how stylish and trendy this home is, while marrying the concepts of the old and the new. 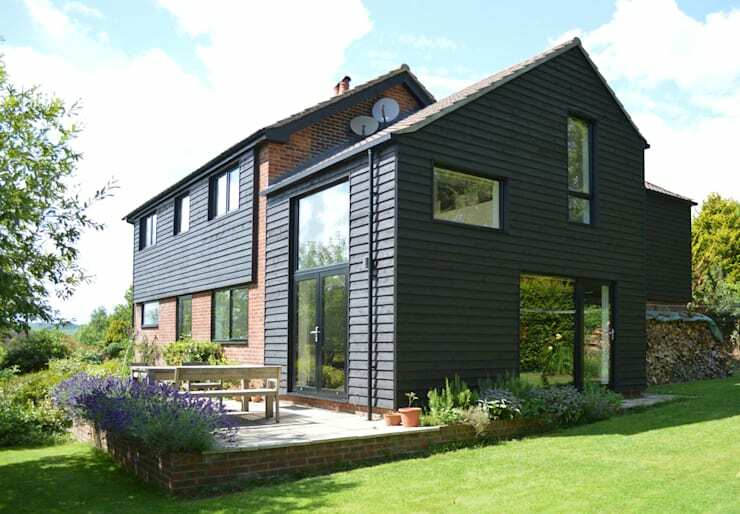 The black timber cladding not only looks incredibly contemporary, but it thermally insulates the house. It also works in harmony with the extensive use of glass throughout the facade, which allows natural light to flow into the home as well as offers a slight transparent barrier between the interior and exterior spaces. The red facebrick ties the design back to the original structure, bringing in some country charm and traditional English elements. 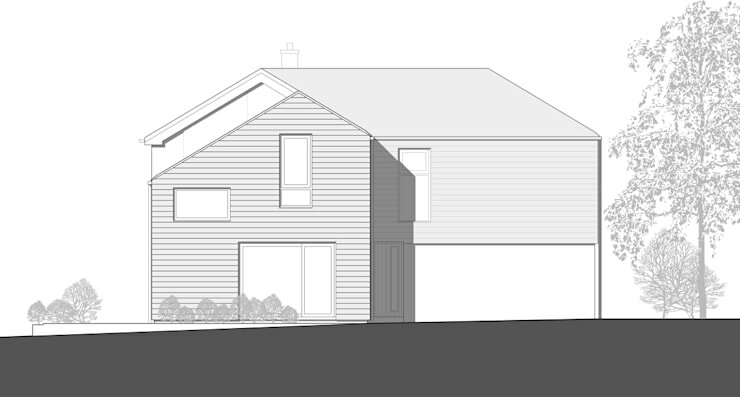 In this image, we come across an East elevation drawing of the two-storeys and the over-garage extension. These kinds of drawings are incredibly important as they allow the architects and the home owners to stay on the same page when it comes to a home refurbishment or design. This also clearly depicts what the home will look like after the construction. If we compare the image to the front of the home, which we saw in the previous image, we can see that they are very similar. The drawing is spot on! Don't you love how they set the tone for a very modern facade, with clean lines right from the planning stage? 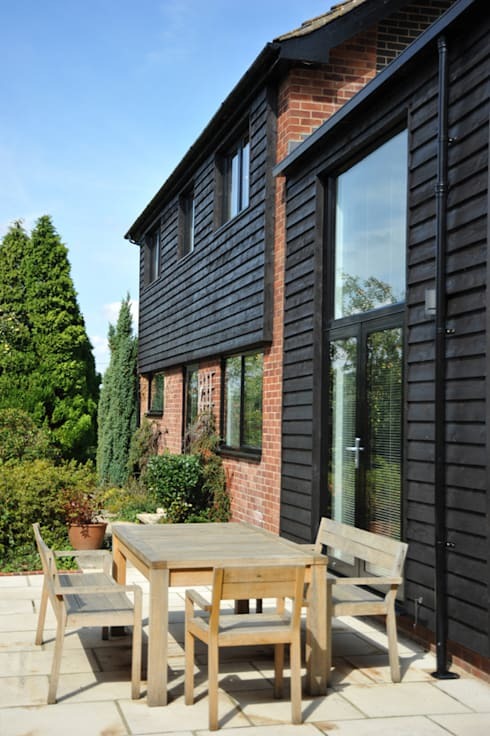 The extension and refurbishment has made provisions for a simple and functional patio space, that is very effective. This area allows the family to enjoy the fresh air and sunshine as well as soak up the gorgeous garden, which surrounds them. We can see that glass doors open up onto the patio, visually and physically expanding the living space. This creates another little interactive nook! The designers have gone for simple, durable furniture for this space, which will last in all weather conditions—a great design tip. Wood is always a great option as it looks stylish and is resilient too. Have a look at these: Tips for how to build a patio in your backyard in 7 easy steps. The interior of the home also mixes the old and new concepts! For starters, the furniture and colour palette inside the home is very sleek, refreshing and modern. The black and white contrast is very dramatic but is effective because of the natural light that flows into the home, thanks to the large glass windows and doors. The designers have added very stylish touches throughout, including the funky lampshade that hangs over the dining room table. Yet the artwork used in the living space is reminiscent of another era, bringing in a more classic look and feel. In this image, we can see how the kitchen and dining room interact with one another, creating a wonderful social environment. The diners can chat to the chef while he or she whips up a feast! The kitchen island slightly divides these rooms, while still allowing for a flow between them. When you have a smaller kitchen, this is a great feature as it allows for extra surface space to prepare or cook food as well as extra storage space. In this image, we can see what a big role lighting plays. 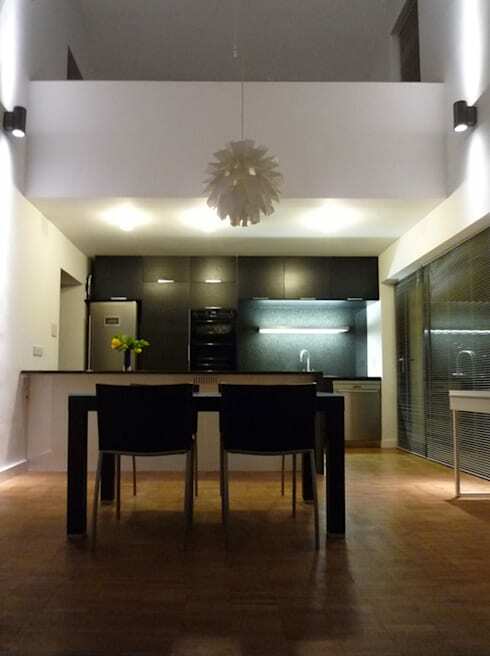 Lighting needs to illuminate certain features in the kitchen and allow the chef to see what she or he is doing, without overwhelming this space. The designers have achieved the right balance here, providing functional lighting that still creates ambiance and atmosphere. 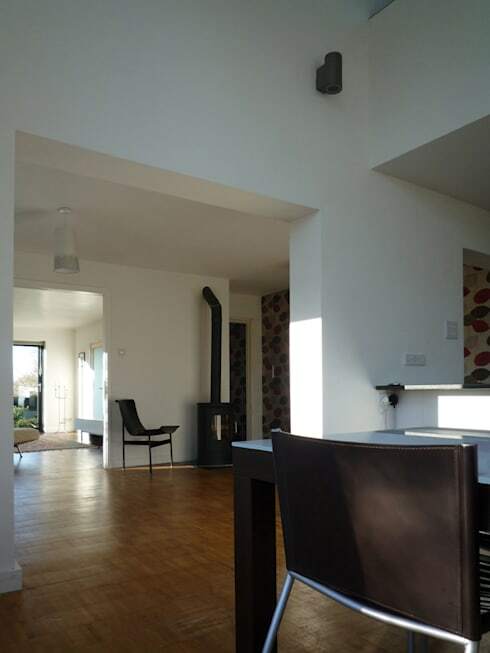 In this image, we can see how the open plan design remains throughout the living space, witch each room flowing onto the next. The wooden floors soften the black and white tones, creating a more homely look and feel. The fireplace is also a wonderful addition and is perfect for winter, creating a very cosy spot! In this image, we can also see how stone cladding has been used throughout the interior, which connects the home to the nature that surrounds it, while bringing in a slightly rustic touch. We end off our tour in the bathroom, which is very peaceful and serene. The designers have chosen lighter colours for this room, allowing for a softer ambiance. The long glass mirror on the wall has been carefully positioned, ensuring that it not only provides a space for the family to see themselves while they brush their teeth or apply their make-up, but that it visually expands the space so that it looks that much bigger. The little pot of flowers is very simple but effective, adding a natural form of decor to the room without cluttering it. This is a great tip for any room. 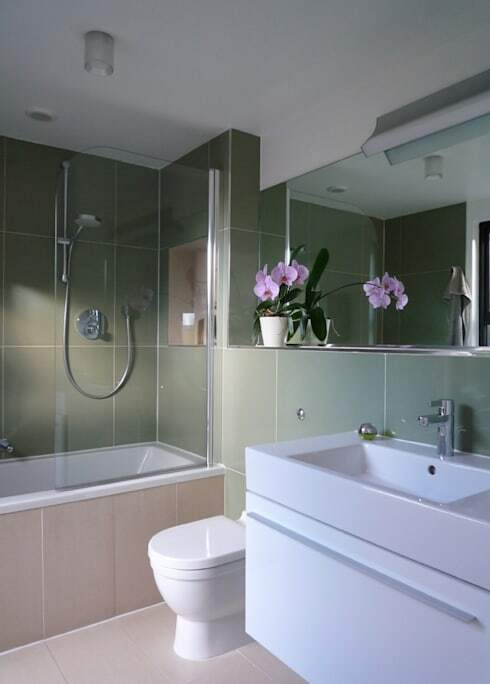 Have a look at these: Tips for saving time (and money) renovating your bathroom. What do you think of this mix between the old and the new?